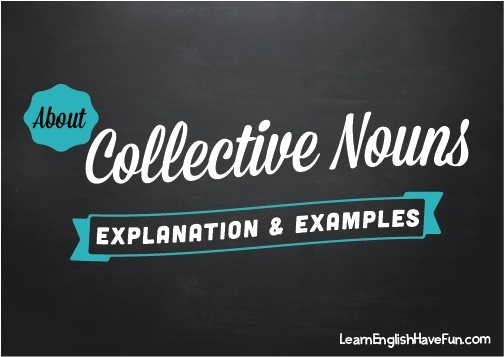 Collective nouns represent groups of persons, places and things that act as a single unit or entity. (By the way, if you need an overview of the different types of nouns, click here). a group of people who give advice to a government leader. a group of singers, especially in a church. a large group of people that come together somewhere. a group of people that compete in a sport against another group of people; a group of people that work together. a large military group; a group of people who are involved in an activity. a group of animals (this is used for only certain animals: e.g., cattle, horses, elephants). a group of people who watch or listen to a performance. a group of people who make changes for a government, a group of people gathered together. a group of people who play music together. a group of teachers in a school or university. a group of people who live together in an area controlled by a government. a group of people who are selected to do a job or make decisions about something. a group of students who study together or graduate together. a group of musicians who are directed by a conductor. In American English, collective nouns use the singular form with verbs. That is because we consider collective nouns as a single unit (or collection of things). My favorite team plays today. (NOT my favorite team play today). The band plays at the arena on Saturday. That family is very large. The choir sings gospel music at church. However, in British English, they often use the plural form. NOTE: There are plural forms of collective nouns. For example, one team, two teams (two different groups of players).